Every year, somehow the planning of the family reunion lands squarely in your lap. This year, use this handy guide to make things easier on yourself! 1. First things first. Decide on a location. If you have relatives traveling from across the country, make sure you choose a location that has an easily accessible airport. Try to choose a place closer to the biggest contingent of your family, unless everyone agrees to visit a particular destination. Since you’re the one planning, remember that you can make a good case for home field advantage –you know your city better than any other place. 2. Set the date. Find a mutually agreeable date can be hard, but if you send out an email survey, you’ll be able to see what dates work best for most people. Once you’ve set the date, don’t change it. It won’t work for everyone –the best you can do is to choose a date that works for MOST people. Give yourself plenty of time! You’ll need the time to plan, and your attendees will need time to make travel arrangement or save money to offset expenses. You’ll need time to reserve venues, get things printed, have t-shirts made and to delegate various jobs. Advance planning means you won’t be mailing attendees their souvenirs after the fact! 3. Engage the troops! You’ll need to get a handle on how big your event your event will be. Create a Facebook Event page for the reunion and then head to SignUp.com to create a SignUp. You can get a handle on how many people are coming and what their general interests are right from the beginning. Free SignUp sheets will save your time, stress and time getting everyone organized and pitching in. Promote the SignUp on the Facebook Event page by posting a link. Have family members sign up online 24/7 from their computer or smartphone, collect their t-shirt sizes, and find out where everyone wants to go! 4. Enlist Help. Just because you’re in charge doesn’t mean you have to do everything yourself. It’s been proven that people have more fun at an event they are invested in. Don’t do it alone. 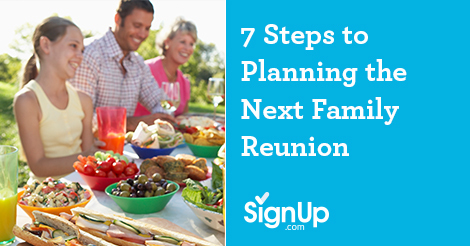 Once you have an idea of how big your reunion is going to be, you’ll have an idea of how much help you’ll need. Ask for donations to help offset early expenses. Survey the group’s skills and talents, and ask for volunteers and then add additional sign-up sheets within your Reunion SignUp for each event. Can someone organize a picnic? Are there enough local people to help with transportation? Does anyone belong to a pool who would be willing to arrange a group swim? Maybe you have some exercise coaches who would be willing to lead a group hike or exercise classes. 5. Keep It Affordable. One last thing to think about is the disparity of ages and income levels inherent in any large family gathering. Consider young families who are always strapped for cash, seniors who are living on fixed incomes and everyone in between. Make your choices with all income levels in mind so that the reunion is affordable for everyone. Some families collect donations and plan fundraisers before and at the reunion to cover some costs for members who would have a hard time affording the reunion. 6. Planning is key, but build in some down time, too. Plan events that will involve all members together and remember to include time to just sit, talk, reminisce and be together. Beyond that, provide lists of other activities such as golf, hiking, shopping with telephone numbers and possibilities for transportation. 7. After the last traveler has returned home, ask everyone to forward their pictures and memories and compile a digital scrapbook of the reunion. Be sure to thank everyone who helped out! Looking for more great Summer Activities & Events? Check out our Summer Idea Center here.